The large passenger van segment in Europe slows down its double digit growth in Q3 of 2015, up 8% in the quarter and still +13% year-to-date. The main reason for the slowdown is the model changeover from the Volkswagen Transporter/Multivan from the T5 generation to the T6, which causes the segment leader to lose 34% of its volume in Q3, which sets it virtually flat for the year so far. The Fiat Ducato holds on to its 2nd place, keeping the surging Mercedes-Benz V-Class at bay, even though these two models had almost identical sales in the third quarter. If we add the V-Class’s “tradesman”-version Vito Combi into the mix, the Mercedes-Benz twins outsell the Ducato to take the #2 spot. 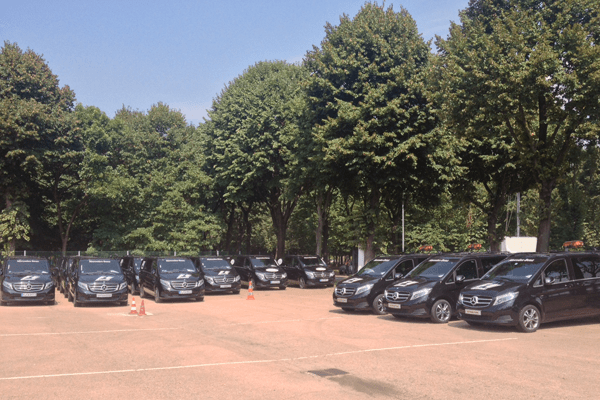 The 36% loss for the new Vito can be explained by the number of Viano sales that were included last year, from before the Viano was replace by the V-Class. The Renault Trafic Passenger and Opel/Vauxhall Vivaro Tour twins are getting close to each other sales-wise, which means the GM version is catching up quickly, and defending its turf against the Ford Tourneo Custom. The new generation large Transit Tourneo has also started deliveries, as it is up almost threefold in Q3 and now up 42% in the first nine months. Also check out the 2015-H1 commercial van segment in the United States. 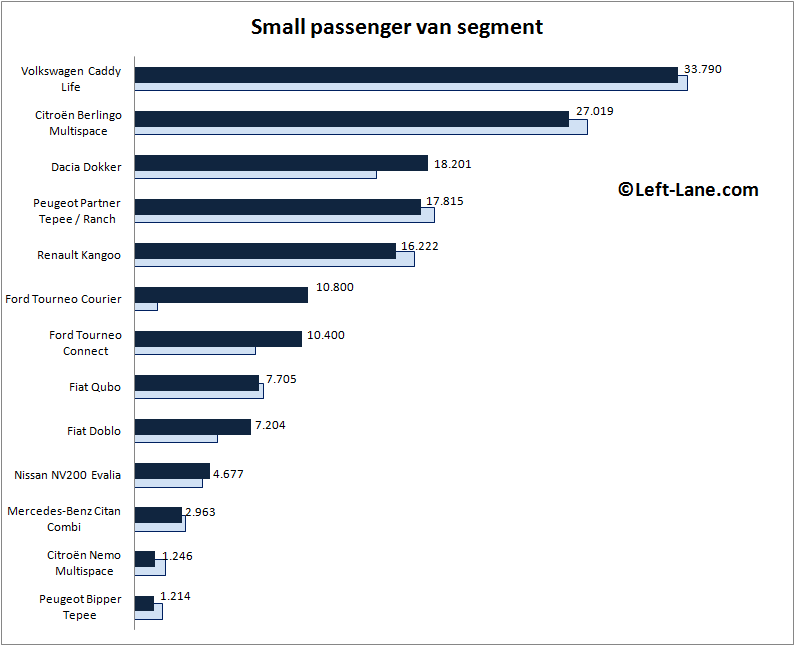 Sales of small passenger vans in Europe, called Ludospaces in French, are up 5% in Q3 and +9% in 2015 so far. Like its big brother, the Volkswagen Caddy is in the middle of a changeover to the new generation, and this also affect its performance: down 15% in the quarter and -2% year-to-date. As a result, the Citroën Berlingo Multispace managed to come within 800 units of the Caddy, not enough to outsell its German rival. The Berlingo did manages to fend off the Dacia Dokker, which was outsold in Q3 by the Berlingo’s twin Peugeot Partner Tepee (named Ranch in the UK). The latter has now leapfrogged the Renault Kangoo for fourth place. At Ford, the smaller Tourneo Courier manages to sell better than its larger sibling Tourneo Connect, in the similar way that the smaller Fiat Qubo is still ahead of the Doblo. The Nissan NV200 Evalia keeps doing better in Europe, possibly helped by its electric version e-NV200 Evalia. The Mercedes-Benz Citan doesn’t seem to catch on as a passenger version as it appears to do as a cargo van. Its original, the Kangoo still sells 5,5 times as much. Thanks! could you also post figures of LCV sales? 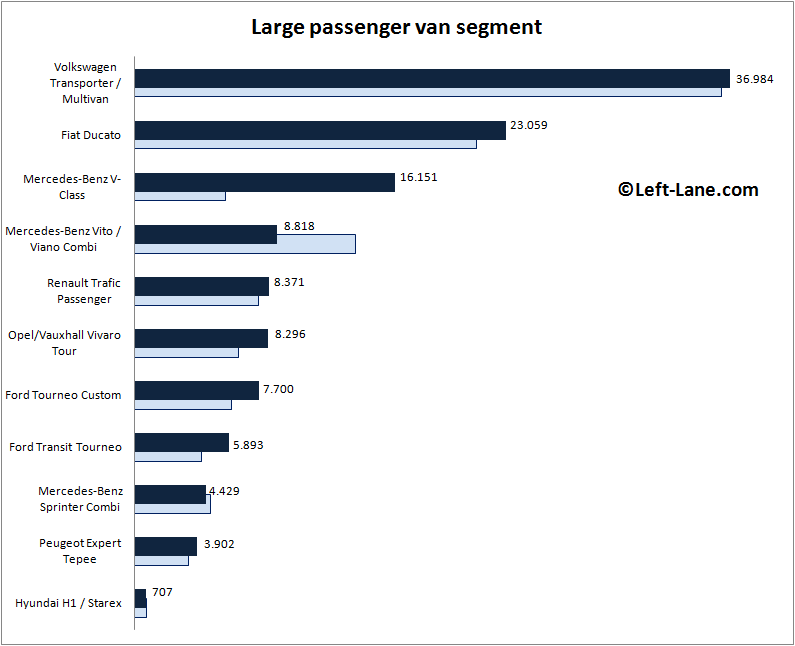 I’ve just published a post with 2014 European LCV sales, which is the most recent data available.